As a family, we’ve been on the Whole30 for 9 weeks. He cut out dairy and gluten two weeks before we started and two weeks into the first official month, he cut out nightshades as well. While I do my best to offer variety, I will admit that the poor man has been eating A LOT of chicken and sweet potatoes. His one saving grace though, is poultry seasoning. I saw “poultry seasoning” on the Whole30 shopping list when I first read the book and honestly, I ignored it. I figured that I had plenty of spices in my cabinet and could make a tasty dinner without relying on ANOTHER over-priced spice that I could only use on chicken. I should have taken heed though, because while yes, I do have plenty of spices in my cabinet – and yes, I can make a delicious dinner without poultry seasoning – sometimes it’s nice to have something different. If you go to the store, you can find poultry seasoning with all the other spices. It’s a blend of a few savory spices, including rosemary, marjoram, sage and thyme. There’s a good chance you have these spices in your cabinet already, which is one reason why you should make poultry seasoning instead of buying it. My local Walmart has organic poultry seasoning for $3.99 for less than one ounce, which just seems a bit pricey to me. There wasn’t another non-organic option, so if I was going to buy it, that’s the best price. It seems silly though to pay for a blended spice, when you probably have everything already at home, right? In addition to those lovely green herbs, there’s a little bit of nutmeg thrown in there too, which makes your nose go, “Mmm… I wasn’t expecting that.” It’s very similar to how my slow cooker carnitas contain cinnamon – you’d NEVER expect that spice to be in the recipe, yet it’s one of the reasons why the meat is so good! 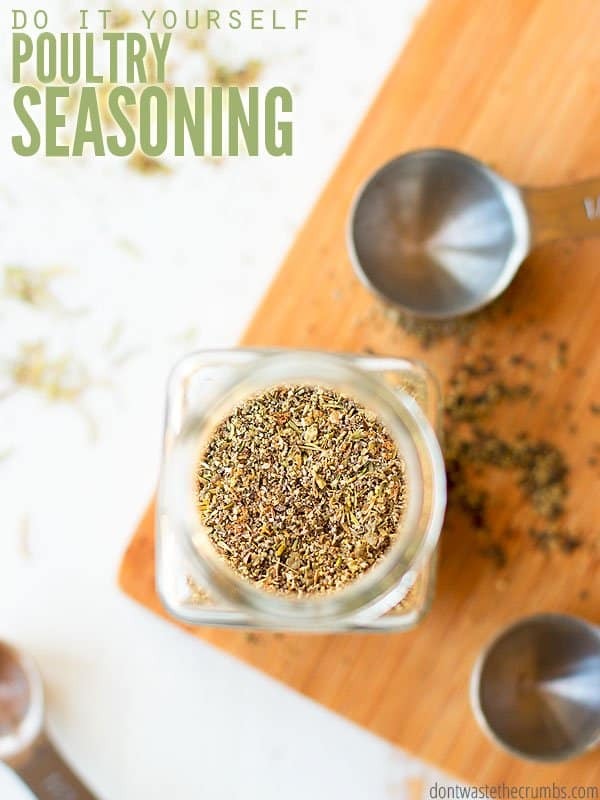 Some homemade poultry seasoning blends include other spices too, like lemon peel, allspice or savory… Honestly, I don’t have any of those in my spice cabinet so I figure you don’t either! 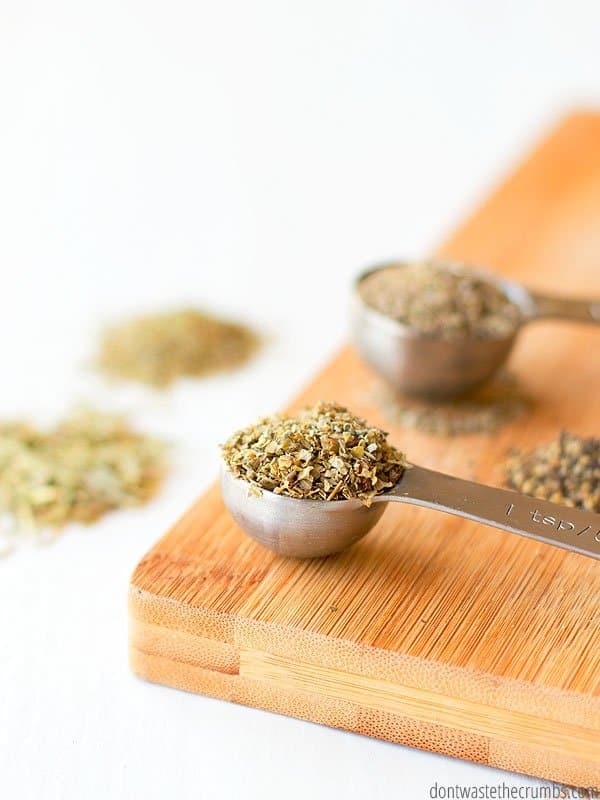 I made poultry seasoning using dried herbs because that’s what I have on hand. Most of the time, I buy my dried herbs from Walmart or ALDI. Sometimes they’re organic, sometimes they’re not. It just depends on the selection and my budget. You can definitely make it with fresh herbs, but it wouldn’t be cost effective unless you either found ALL of them marked down at the same time, or you have an herb garden. You can omit or substitute based on what you have at home. Really truly, if you don’t have something, just leave it out! Despite what some people may say, you don’t HAVE to have sage to cook chicken, and you don’t HAVE to have any of the other spices either. I would suggest though, that you have at least three of the four green spices if you really want to call it a “poultry seasoning.” Not that you can’t make it with two, but at that point you’re just seasoning from the pantry… and not really making a special blend, if that makes sense? And I’d hate for you to use your homemade poultry seasoning blend – minus half the ingredients – in a recipe where perhaps the sage or rosemary was important and then your dish not turn out. So bottom line, aim for 3 of the 4 green spices. You can customize the blend. Don’t have dried rosemary? Use ground! Have rubbed sage and not ground? Use the rubbed! Have whole thyme? Use it! 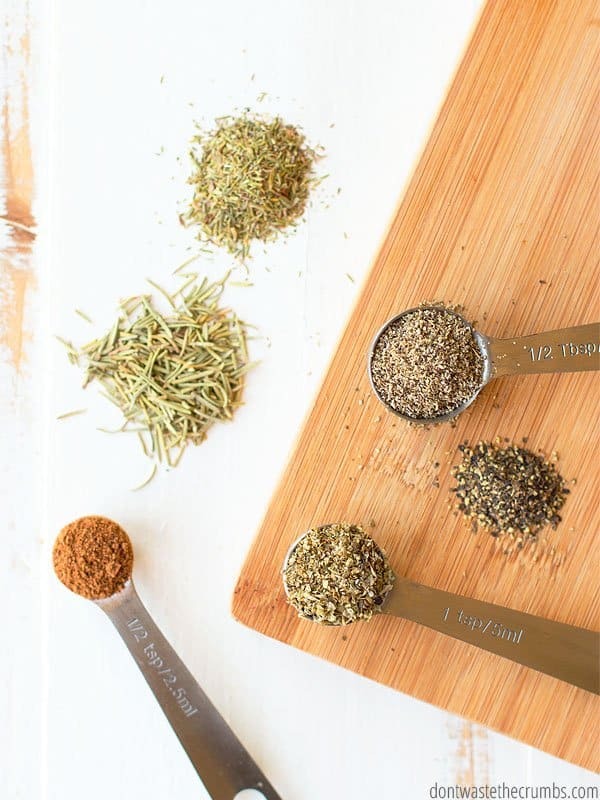 I like the texture differences between the spices and chose to leave all of them whole, but you can easily put all of the spices in a spice grinder, a cheap old coffee grinder or even your blender (I have this awesome blender) and turn it all into a fine powder. It’s up to you! I left out the salt. Salt is an essential nutrient that the body needs, but I intentionally left it out of this recipe. That way you can salt your dish however you want, without the salt from a seasoning blend interfering. Remember to read the ingredients in your salt. Many table salts contain dextrose, an artificial sugar. It’s supposed to be there to prevent clumping, but it’s still fake sugar and not necessary. I bought this 10 lb bucket of Real Salt a few months ago and I still have TONS left. And it’s so tasty too! Poultry seasoning isn’t just for chicken! I made a super simple baked chicken the other day, adding 1 Tbsp of poultry seasoning to 2/3 cup of almond flour. My husband LOVED it. It was different from the chicken I’ve been making and it wasn’t any harder on me! It would also be great all-purpose seasoning on spatchcocked chicken, and slow cooker shredded chicken or Instant Pot whole chicken, or almond crusted chicken or even homemade chicken nuggets! Double the recipe, at a minimum. Remember how I used this poultry seasoning for a simple baked chicken? I doubled the recipe and intended on having some left over, but didn’t. I HIGHLY recommend making a big batch of this so you have it whenever you want it. I re-use spice jars when they’re empty and fill them with my own blends, but these are very similar! 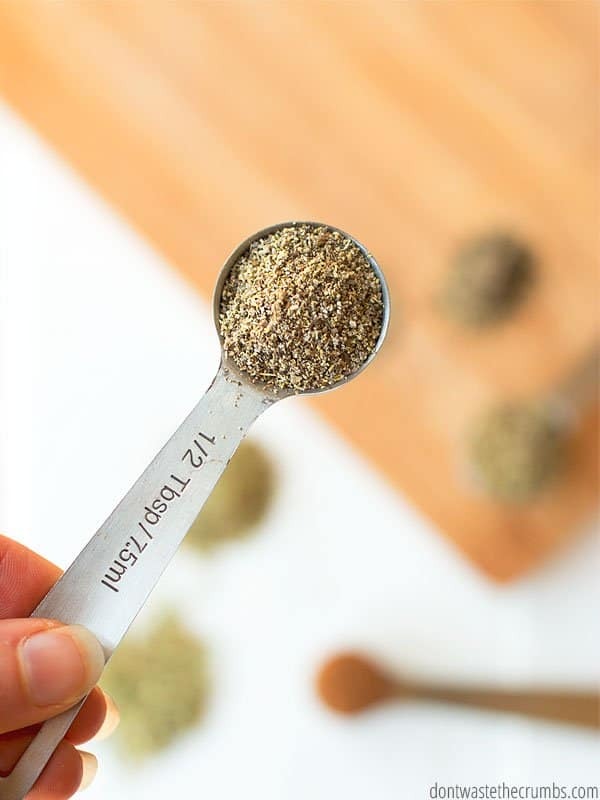 Making your own poultry seasoning is so simple! Save at least $3 a jar by making your own mix of poultry seasoning. Mix and match ingredients you have on hand to fit the budget and suit your tastes. Use your own jars with labels removed or use a set like this for your homemade seasonings. 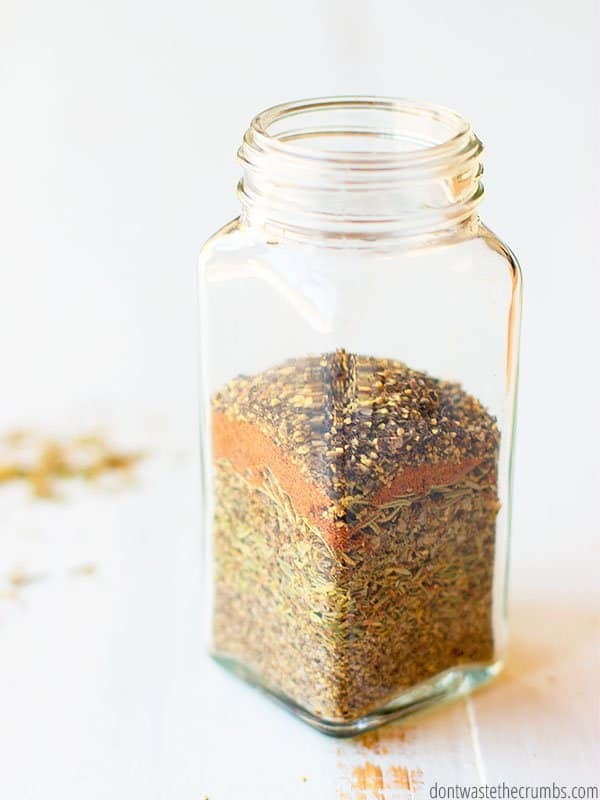 Make more homemade seasonings like Montreal Steak Seasoning, Dry Onion Soup Mix (perfect for Classic Pot Roast! ), Taco Seasoning, 6 more spice mixes, and even Pumpkin Pie Spice Mix! Combine all ingredients in a container. Use as desired to season your poultry, vegetables and sauces! What would you do with poultry seasoning, besides use it on chicken. Tell me your awesome ideas in the comments below! I have a recipe I’d like to share with you. Though it isn’t exactly poultry seasoning, it can be filed under sauces/condiments. Though I don’t remember where I found it, this is a homemade version of extra crispy Shake N Bake. Unlike the boxed version, which is usually only for chicken, you can use this one for chicken or pork! If you like, you could even try steaks with it as well. I might even try it with salmon! When you look at the recipe, you’ll notice there are no yucky preservatives. Nothing but ingredients you have right at home! I made this one at a cooking class hosted by Mama Jane, where I was the teacher that day. I made chicken with it. Let me tell you, none of her students could tell the difference! They all said that it tastes just like the store-bought version! 1. Combine all ingredients and mix until well blended and there are no big clumps. 2. Transfer to airtight container. 3. Preheat oven to 400 for Pork or 425 for Chicken. 4. Pour some of the mixture into a large zippered bag. 5. Wet each piece of meat and shake off excess water. 6. Place in the bag and shake to coat. Shake off excess breading, place on baking sheet. 7. Bake pork chops for 15-20 minutes. 8. Bake bone-in chicken for 40-45 minutes. 9. Bake boneless chicken for 20-25 minutes. 10. Let cool for 15 to 20 minutes, then store in refrigerator or freezer. 11. Heat in the microwave, an oven, or even an air fryer, serve and enjoy! And, if you like, you can make the Crunchy Pretzel version by substituting 3 cups crushed, unsalted pretzels for the bread crumbs. Or if you want salted pretzels, you can eliminate the salt. Also, when preparing the oregano, parsley flakes and basil, make sure they’re made into powder so there are no visible specks. You can do this by putting them in a grinder, or simply crushing them in a plastic sandwich-size zippered bag with your hands.